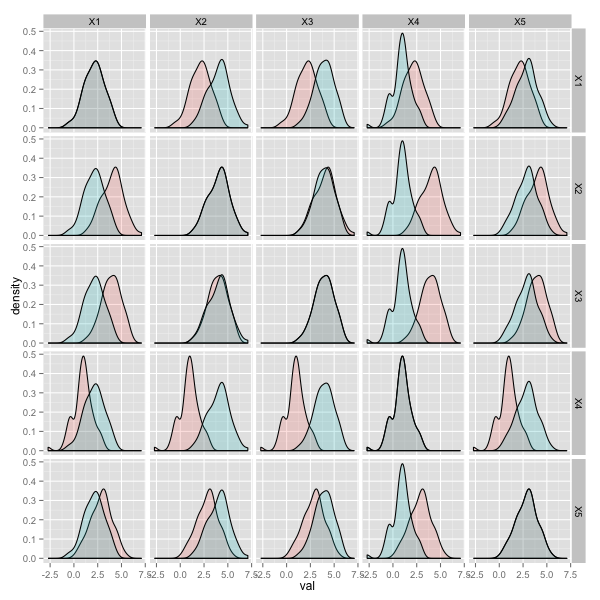 While analysing some data from a dose respons screen, run across multiple cell lines, I need to visualize summarize curve data in a pairwise fashion. Specifically, I wanted to compaure area under the curve (AUC) values for the curve fits for the same compound between every pair of cell line. Given that an AUC needs a proper curve fit, this means that the number of non-NA AUCs is different for each cell line. As a result making a scatter plot matrix (via plotmatrix) won’t do. 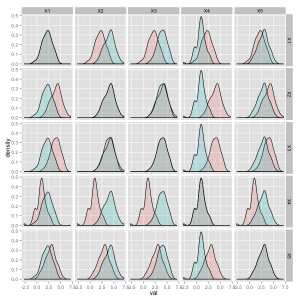 A more useful approach is to generate a matrix of density plots, such that each plot contains the distributions of AUCs from each pair of cell lines over laid on each other. It turns out that some data.frame wrangling and facet_grid makes this extremely easy. Giving us the plot below.